Green tea or matcha, from drinks to cakes to ice creams and masks — it’s absolutely everywhere! Some of the best tasting matcha goodies are in Taiwan so if you’ve fallen for the delicious green treats as much as we have then join us as KKday hops on the matcha bandwagon to find five places in Taiwan that serves the best matcha flavored food! Myowa Japanese Sweet Cafe is famous in Taiwan for their matcha treats. So what are the things you must try in Myowa Japanese Sweet Cafe? 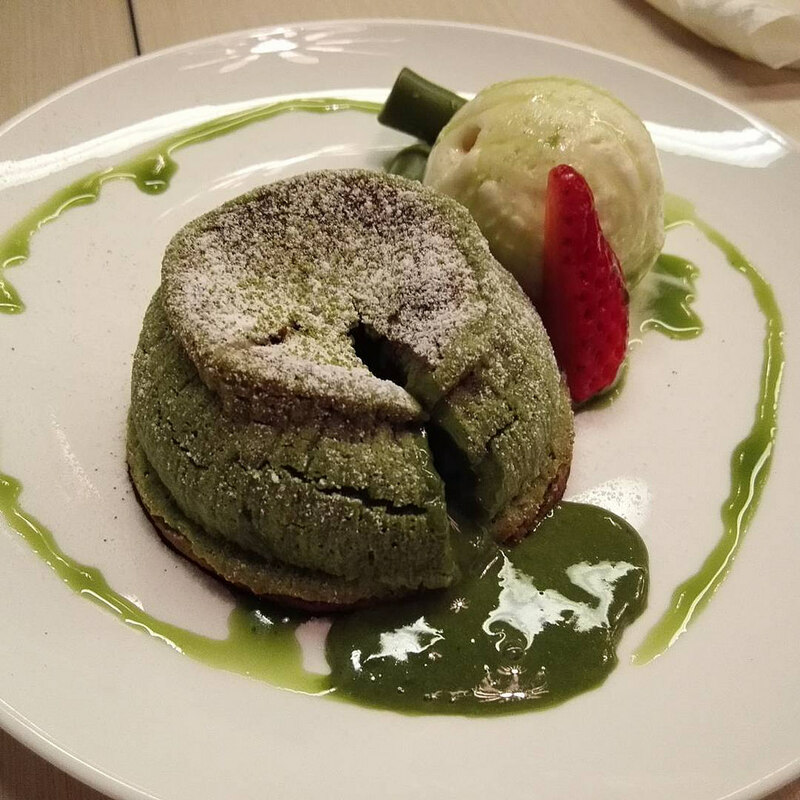 Stab your fork into Myowa Japanese Sweet Cafe‘s matcha lava cake and watch the green tea flow out while you satisfy your matcha craving.But going all the way to Taiwan for a typical, mainstream matcha cake? Nah, KKday has something better for you. You’ve tried hot-plate tofu, but have you tried hot-plate matcha cake? Another must-try of Myowa Cafe, hot-plate matcha cake appeals not only to your taste buds, but your other senses. Listen to the sizzling sound of matcha, see how it bubbles on the hot-plate, have a whiff of the aromatic and distinctive matcha scent and finally, prepare your tastebuds for what they call the smokin’ hot matcha cake. If you’re heading to their stores in Taipei, brace yourself for a long line of matcha fans because Taiwanese are crazy about their food! During the Edo period (circa 1860), Tsujiri was established by a man named Riemon Tsuji in Uji, Kyoto. His passion for tea led him to produce only the highest quality Gyokuro tea leaves with prolonged freshness and enhanced flavour and sweetness, revolutionise the tea industry. If you decide to pop by Tsujiri, head straight for their classic matcha dessert. Tsujiri is even better during summer — don’t miss their limited edition seasonal matcha desserts that you can only get your hands on during summer! Stepping into Heiankyo Japanese Tea House, you’ll notice Heiankyo‘s architecture and interior is designed to resemble one of Japan’s ancient cities. They prize themselves as one of the more classic cafes with elegant settings and Tatami rooms to complete the ancient Japan feel. Have a taste of matcha tea made by the owner himself accompanied by other matcha delights like matcha ice cream, matcha crepe, matcha affogato and who knows what other goodies is in store for us? You’ve spent a ton on travelling and shopping and you’re left with only coins for food? Oh boy, you’re in luck — Matcha One, one of the famous cafe in the neighbourhood, is known to be kind to their patrons’ wallet. With the thick matcha sauce bursting out of their cakes, Matcha One is definitely another cafe worth checking out. Originated from a matcha specialty shop in Hokkaido, 108 Matcha Saro has two branches in Taiwan. Besides trying their all time favourite matcha ice cream, go for the other well-received desserts of 108 Matcha Saro — matcha warabimochi (a jelly-like confection) and matcha pancake. Unlike the normal flat pancake, Matcha Saro‘s pancake is similar to Mr Bean’s pancake — round with green tea or red bean fillings. Take a bite and taste the feeling of green tea oozing out into your mouth. Friday and Saturday: 11am to 10pmShoutout to all matcha addicts, it’s time to pack your luggage for a holiday in Taiwan. Looking for more Taiwan guides?